This documentation describes each setting of the Give Annual Receipts add-on. These settings control how receipts are presented by year, and the design and content of the PDF receipt. The following settings affect the presentation of the PDF for all annual receipts. The layout of the receipt is intentionally not very flexible in order to provide a very clean and static receipt for tax purposes. To see each of the settings below in a live example, download this sample pdf. This setting enables annual receipts for the whole site. All of the following settings only become visible once this setting is set to “Enabled”. Note that even when the plugin is activated, annual receipts will not be available to either your donors or to site administrators if this setting is not enabled. This setting determines which date is considered the last day of the tax year for your organization. Some countries define a tax year differently from the calendar year. This enables the tax year to be set to the appropriate date. For example, if the tax year is considered to start from July 1, then setting this to “June 30” will mean that all donations given before June 30 2018 will appear in the 2017 annual report. Donations given from July 1, 2018 until June 30, 2019 will appear in the 2018 annual report. 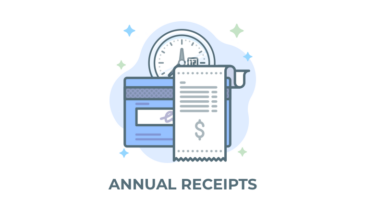 This allows you to upload or choose a logo for inclusion on your annual receipts. This logo will appear by default at the top center of each annual receipt. A sample annual receipt showing the Give logo positioned at the top of the PDF. This field adds text before the donation receipt table on the PDF. This field supports text only, no HTML. Line breaks are respected. No goods or services were provided in exchange for these contributions. This adds content to the very bottom of the PDF receipt. This is useful for your organization’s basic contact information. This field supports text only, no HTML. Line breaks are respected. This text is output below the footer, and the text is slightly smaller. This is useful for your organizations tax identification number. This allows you to open a preview of your PDF in a new window with default preview content populated. Note that in order for your changes to be reflected in this preview you must first save your settings, and then click the Preview button.